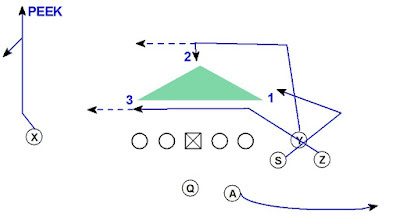 Here is a 5 Step passing concept from a bunch formation designed to create an interior triangle read for the QB. The post-snap read progression is an interior triangle read. The first route in the progression is the S on chase route. The S is letting the Z & Y clear while selling a flat route. 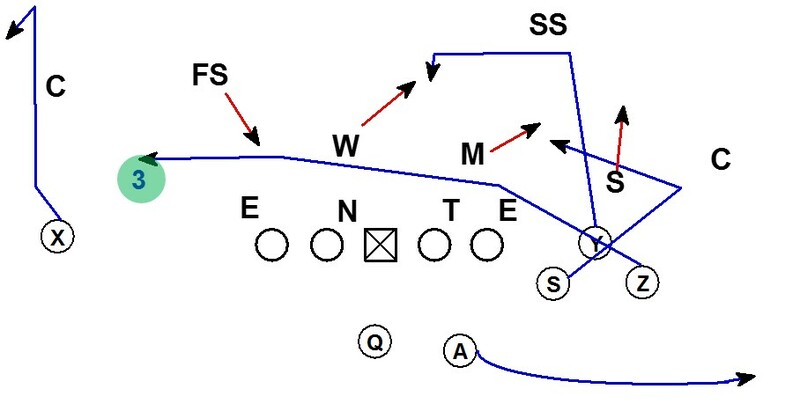 The chase route is three hard steps outside, plant, and angle into MOF chasing the Drive route. The chase route is climbing to a depth of 5 yards. If the inside linebackers drop with depth the chase route should be open. 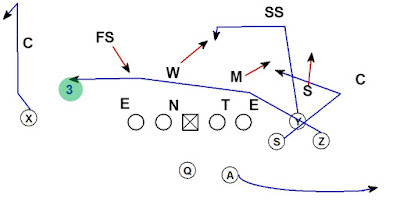 The second route in the progression is the Y on the dig read route. The Y should take an outside release and break to the dig at 10-12. 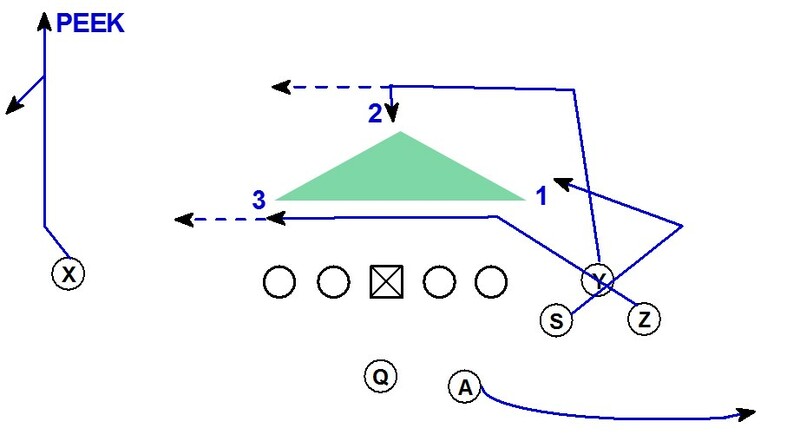 The Y is reading for open space to settle and square his numbers to the QB. If there is a zone dropper underneath; the Y will keep working inside until there is open space to settle. If there is a player running with the dig in man; the Y will keep running across. 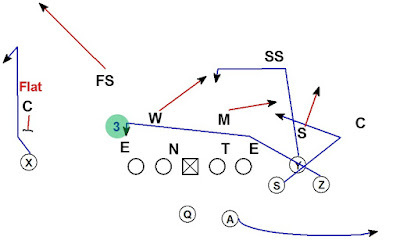 The Y does not settle the route vs. man coverage. 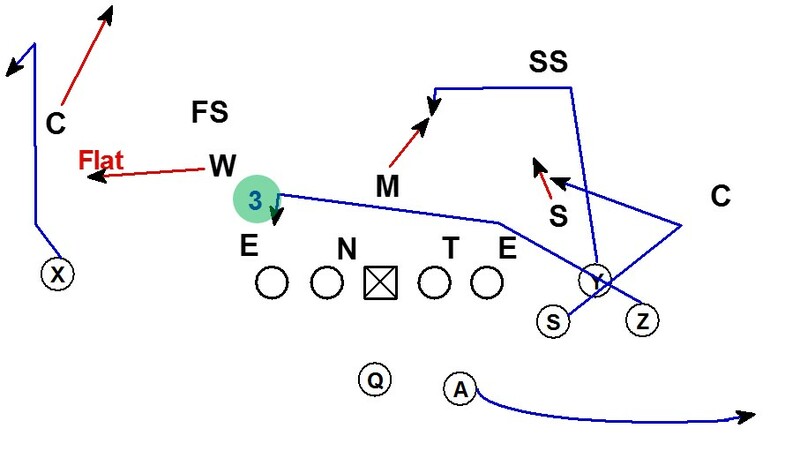 If the ILB takes an angle to cover the chase route; the dig should be open. 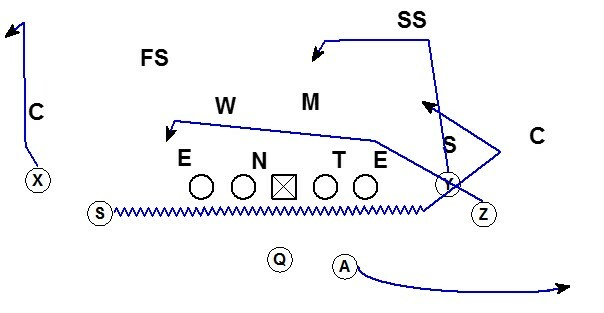 The third route in the progression is the Z on the drive read route. The Z is releasing at the heels of the DL and gaining ground. 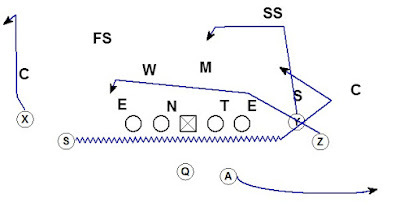 As the drive crosses the Center; the Z is reading the flat defender. If the flat defender is wide, the Z is squaring this shoulders and showing his numbers to the QB. On the away side the X is running an outside release vertical. 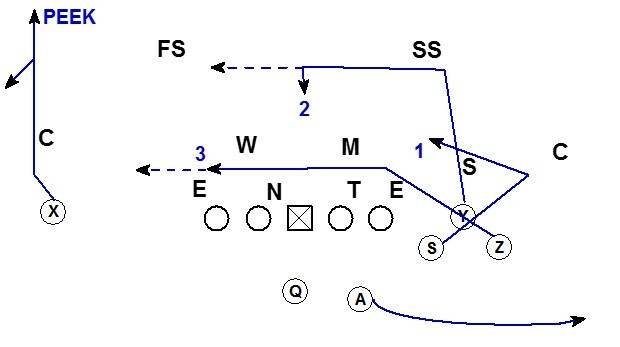 Against press coverage the X will run a vertical and must be ready for the peek throw from the QB. 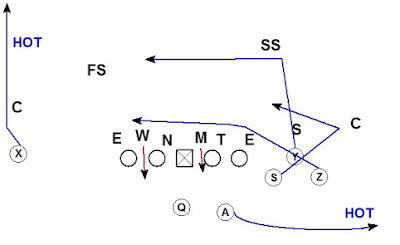 If there is no press coverage; the X will turn the vertical into a comeback at 10-12 yards. The comeback is there is force the flat defender to widen. Here the ILB’s take angles to take away both the Chase and Dig routes. The Z is reading on the drive route. In this example the FS is inverting to the flat. The X runs the comeback to force the FS to widen. The Z will settle in area of the OT. The max depth is 5 yards. Here the flat defender is the Corner. Again the Z will settle & square in area of the OT. Here the flat defender is the ILB expanding. Again the Z will settle & square in area of the OT. 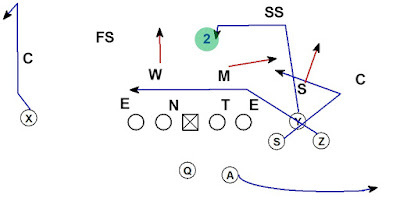 If the flat defender does not expand to cover the comeback; the Z will keep running. 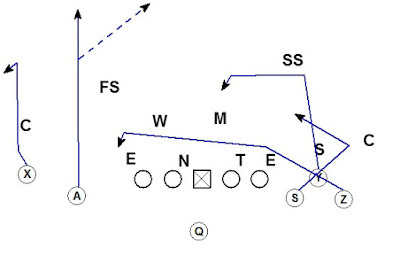 If there is a player running with the drive in man; the Z will keep running across. 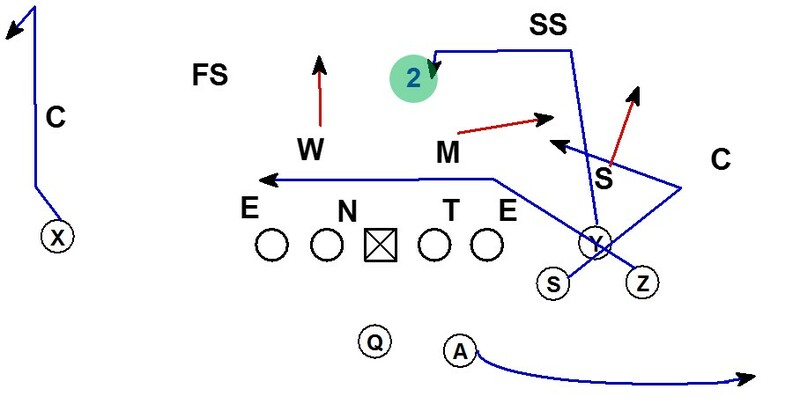 The Z does not settle the route vs. man coverage. 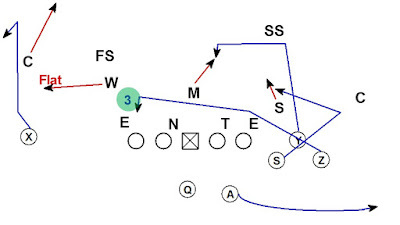 The Z will also keep running if any zone defender attempts to match up. If it feels like man coverage treat it like man coverage. The A back is running a swing to widen the flat defender to the bunch and is not part of the read progression. 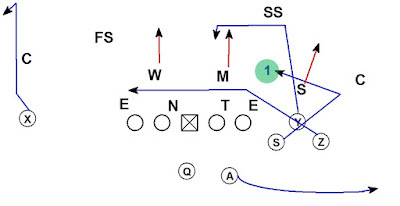 While not part of the read; the A back must be ready for the ball in a hot throw situation. 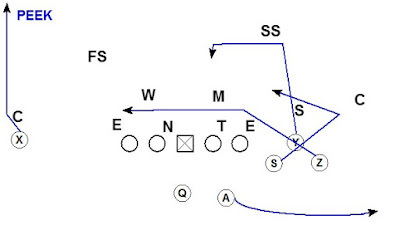 Against pressure the QB can throw the peek vertical to the X if he likes the matchup. The other hot option is to throw the swing route to the A back. 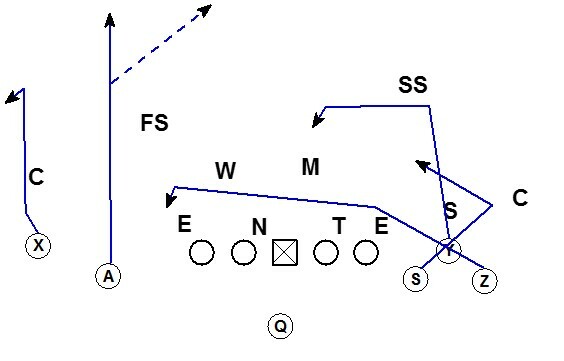 The route can easily be run from a 2x2 motion look. Here the same concept from a 4x1 empty; forces the defense to handle and inside bunch and waste a coverage player on the A back. 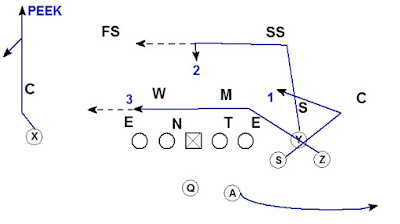 The A can run any route that forces the flat defender to cover him. The route can be run from 3x2 empty as well. 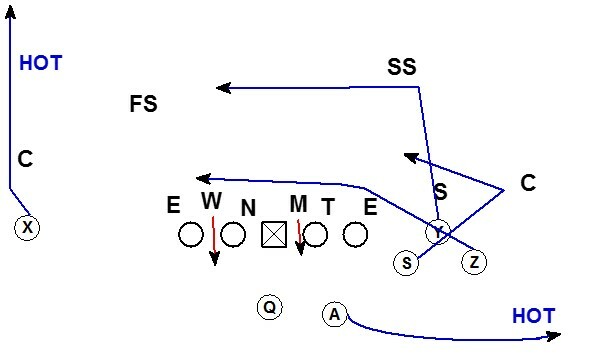 The A runs vertical to clear out space and take the top off the coverage. 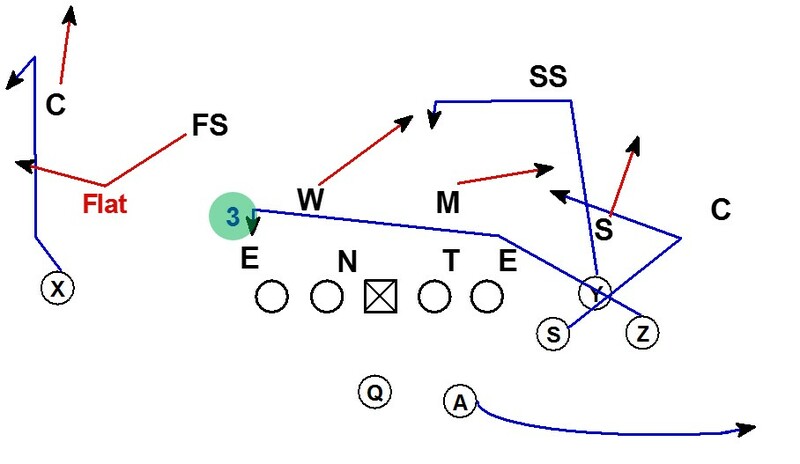 Another option is to run the route from a 3x1 formation with the A back running the chase route. 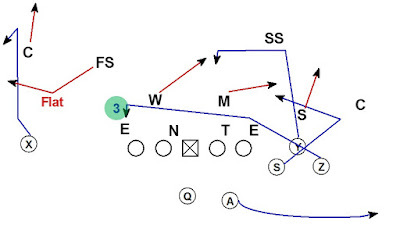 This can be an easy way to get the A back involved in the passing game. In all of the adjustments the QB has the same interior triangle read.